This PDF 1.6 document has been generated by , and has been sent on pdf-archive.com on 22/03/2019 at 12:59, from IP address 193.85.x.x. The current document download page has been viewed 979 times. File size: 1 MB (118 pages). manipulation is an additional urgent concern. 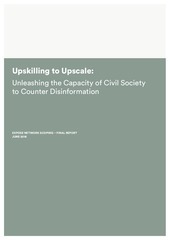 ability of organisations to effectively counter disinformation. operational capacity to do this work at the pace and scale required. frameworks and will drive to increase quality in both research and communications. disinformation in a way that matches the challenge in their local contexts. the use of the Orthodox Church and state-controlled NGOs in foreign policy. be understood and in approaches to countering it. media and Kremlin public diplomacy. Russia and its allies in Syria. via RT/Sputnik social media channels). media through the use of public diplomacy. into the Balkans than the EU. or military unviability of a government. Smear campaign against the BBC. in order to achieve specific outcomes. terror attacks in the UK and France in early 2017.
into Germany, and across the EU generally. the disintegration of the Soviet Union and existing ethno-political tensions. •	Exploit low levels of public awareness and a lack of critical media consumption. among populations vulnerable to Kremlin influence. The scope of this research was Europe, with a focus on the areas prioritised by the FCO. the alleged training of paramilitaries and the subversion of election results. with George Soros featuring prominently. discrediting the EU and NATO, with NATO soldiers a particular target for disinformation. migration, liberalism and the EU. and to weaken Georgian cooperation with NATO. allies by, for example, inflaming Poland-Ukraine tensions. is used to turn people against the European project. independence and support for Russian military interventions in Ukraine and Syria. the wake of terror attacks to promote hatred and increase social polarisation. broader understanding of the Kremlin’s strategic goals. disinformation into six key strands, which are discussed in depth below. contributed to a broader narrative which undermined Soviet credibility. do not always follow the most rigorous standards. staff members at Channel One were fired, and a Russian producer returned to Moscow. disseminated, and the ways in which it is consumed by audiences. real-time using social media monitoring tools. agenda in all the regions affected by Kremlin disinformation. Ukraine while the latter works on discrete commissions. necessary to gauge impact will require long-term investment. there have been examples of successful campaigns which others could learn from. challenges Kremlin narratives and undermines disinformation. Slovak bloggers to create a false online flame-war, pitting their fans against each other. the most successful counter-disinformation campaign in the region. Digital Forensics Lab. It is now starting to be pursued by some media outlets such as El Pais. understanding the emerging field and for designing interventions. themselves as rational and informed. in the UK. Exposing this finite network of disinformation nodes can have a long term counterdisinformation impact. subscribe to articles, an automated ‘fake score,” and a social media page and feed crawler. who have exposed Kremlin strategies in the region. example through narrative television and other accessible formats. falsehoods that are being spread to local, vulnerable audiences. alleged tracked the movement of a Russian missile linked to the downing of the aircraft. gone further than official investigators in naming suspects. whether something was true or false, or manipulative. suspect provenance of the information they are consuming. and in multiple contexts in response to an emerging and rapidly shifting threat. counter disinformation in a way that matches the challenge in their local contexts. and grassroots projects that promote media literacy or community cohesion elements. capacity to do this work at the pace and scale required. potential to be the next generation of activists in the fight against Kremlin disinformation. •	Neutral to tactics; able to adopt a variety of tactics in response to emerging threats. •	Organic; able to emerge spontaneously and adoptive of linguistic and cultural nuances. and how they are being spread. networks utilised by the Kremlin. to the transnational reach of Kremlin campaigns. •	Increase the quality and quantity of counter-disinformation content. •	Increase the sustainability and professionalism of organisations countering disinformation. the disinformation ecosystem exploited by the Kremlin. public, and influencers/amplifiers of Kremlin strategy, tactics and networks. •	Help establish best practice on countering disinformation. •	Undermining the credibility of the Kremlin, their narratives and online networks. •	Building resilience to disinformation in vulnerable audiences across Europe. •	Reducing the number of unwitting multipliers of disinformation. A holistic approach to countering disinformation will target a variety of audiences. increasing resilience among the general population. engagement, public affairs and advocacy. impact, and typology of the narratives that are spread . •	Lack of expertise, guidance and tools to deliver high-quality open source research. communications products that challenge public perceptions about disinformation. proposals, severely limiting their sustainability, as well as qualified staff. These are covered in more detail in ANNEX A: Needs Assessment Findings. Journalists (NUJ) Code of Conduct was a potential limitation. journalism standards. However, even here, organizations do not formally stick to principles. however, like other organisations, they did not officially adhere to them. Baltics. 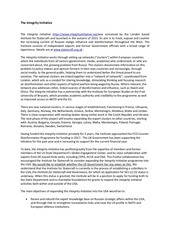 However, the fact-checking capability of potential partners in other regions is limited. efficacy. StopFake was a notable exception. The inability of organisations to monitor social media was a far more significant gap identified. was noted with regards to data science capabilities. a desire to enter this area but noted that they did not have the resources. organisations are keen to exploit this and to develop data science and AI capabilities. audiences, such as Russian-speaking minorities in non-Russian speaking countries. avid consumers of Kremlin disinformation. Security Awareness, carries out offline activities. significant challenge from television broadcasters. brand building they could dramatically increase their millennial readership. out their activities as effectively as possible. most had no awareness of funding opportunities available in their region or further afield. possibility of using digital communications to raise awareness of their fundraising activities. need to seek additional employment. uniformity in how organisations thought such allegations should be dealt with. Moreover, over 80% of the organisations do not have a written discrimination policy. formal system for identifying and preventing risks, and instead responded in an ad hoc manner. security breach, or a process for informing relevant stakeholders that one had occurred. risk. There is also a threat from the compromise of data due to human error or intention. and some do not vet their staff. policy is determined to manage these scenarios. to raise questions about disinformation. This makes them highly visible to malign actors. such a way as to effectively address these gaps and weaknesses. strategy and the response the current geopolitical climate requires. The network will be coordinated through a Central Hub run by the Network Facilitator. a rolling basis if they meet the initial criteria. maintained across any research carried out within the network. issues, such as the OCCRP and OCCI. a variety of tactics to counter misinformation, and a broad subset of cross-cutting issues. organisations that hold the most potential to do so. guidance and advice, to become highly effective actors in this arena. representing untapped potential in a core area that ties to disinformation. campaigns develop locally and across borders, and how they are effectively countered. reduce and counter the impact of disinformation. packages to smaller organisations as part of the scope offered by the Network Facilitator. disinformation, its reputation and mission statement and objectives. broken down by primary activity and organisation type. their impact on the target audiences. Figure 3: The Network Facilitator’s five core activity strands. activities that can otherwise be hard to fund. organisations would have to provide a three-year business projection of income and activities. These grants would work best when granted only to members of the EXPOSE Network. committing to developing more rigorous procedures. members can be signposted to the right support. include personal security and the security of buildings. limited and in some cases impossible for organisations operating in high risk environments. training that is hard to access. is spread evenly and that skill sets have the opportunity to deepen. a lack of resources, this can result in a de-prioritisation of learning. journalism, others require introductory-level training in a number of areas. and need to spread out training alongside other activities and commitments. and that approaches to research, legal and security concerns will vary. and made engaging for learners of different levels. of the network in order to spread knowledge regionally and foster closer cooperation. tools for use by network members. research, communications, sustainability and operational functioning. tools to identify specific disinformation narratives, particularly in response to events. There are a number of partners in the network who could deliver training in this stream. advice on how to implement these. responses online, as well as gauging the impact of counter narratives. and sequencing to establish lines of causation. and mediums that will resonate with their target audiences. comment coding to iteratively optimise their content and dissemination. to plan and run events that further their objectives, addressing the lack of counterdisinformation activities occurring offline. reports into easily shareable infographics. opportunities and how to write a successful application. 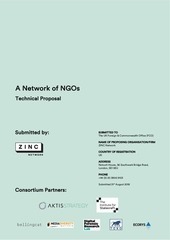 component of the work of the Network Facilitator. how they are being spread, and their impact with specific audience segments. listening in order to gradually transfer responsibility to regional partners. is gathered with high contextual and linguistic capability and that skills are kept in the region. this to outsiders, be they policy makers, funders or peers. most effective in shifting public opinion and building resilience to disinformation. ensuring that all relevant parties are aware of ongoing activity. PR packages, and training in low-resource filmmaking. 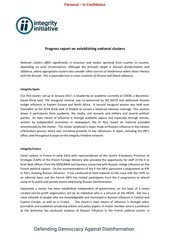 work undertaken by Network members. research and deliver communications exposing disinformation. to local scenarios, but also draws on a broader understanding of the Kremlin’s strategic goals. different times and in multiple contexts in response to an emerging and rapidly shifting threat. the latest data and research, and are not tailored to their audience’s needs. responsible for onboarding these members into the network. the fight against Kremlin disinformation. the media, online amplifiers and the general public. throughout the three-year implementation period. work within a safe and well-resourced environment. security and enhancing communications outputs. understand their impact on the target audiences. together activities and promoting specific approaches if necessary. expose any risks that are identified. secure network correspondence. This has already been designed and tested. in place and uncodified procedures seemingly only in place with respect to hospitality. procedures and to the organisation’s commitment to their proper application. was disparity across all respondents as to how an allegation would be dealt with in practice. access to their services from all groups of society. sanctions and remedies that may be enforced for non-compliance. of the legislation and helping them to interpret and understand the implications is challenging. organisations this may lead to its implementation being overlooked. (2) training in compliance; (3) legal surgery with an EU media lawyer. their work has is accordingly also affected. more simply: high quality journalism is a vital means of contesting disinformation. organisations are battling not just Russian disinformation but hostile/pro-Russian governments. propaganda are independent newspaper outlets. codes or principles, even if similar measures are enacted. comments, and report them if they are in violation of social networks’ community rules. practise and have an awareness that different countries have differing media and libel laws. practise in all their output. and often totally unaware of the International Fact-Checking Network Code of Principles. competently, and almost none had been successfully sued. discussed, the greatest barriers to learning are financial and human resource limitations. This is a near universal problem. competent, employ journalists on a project basis. 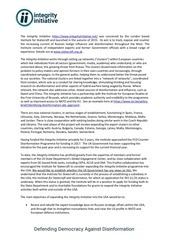 greater capacity in helping to identify disinformation. to upskill here with comparatively minimal cost. organisations as this is the relationship best suited to combating Kremlin output. could be made in this area. This file has been shared by a user of PDF Archive. Document ID: 01925726.